If you’re looking for a reason to get out of the house and shed some of the mid-winter cabin fever – we can help! You might think that because the Museum is closed for the season we don’t need volunteers … but we do! This is the time of year when we do our exhibit cleaning, records organization, planning programs, updating our educational curriculums and so much more. We need lots of help during the next few months. Staff our 2018 programs – our first one is in March! Man the front desk during the 2018 Season (starting Memorial Day Weekend) and help us keep the Museum open on weekends. These are just a few ways we need help but there are lots more! 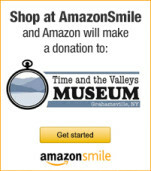 If you have some free time and would like to help the Museum, please send us an email (info@timeandthevalleysmuseum.org) or give us a call 845 985-7700. We can set up a time to meet and chat about where you’d like to help out.